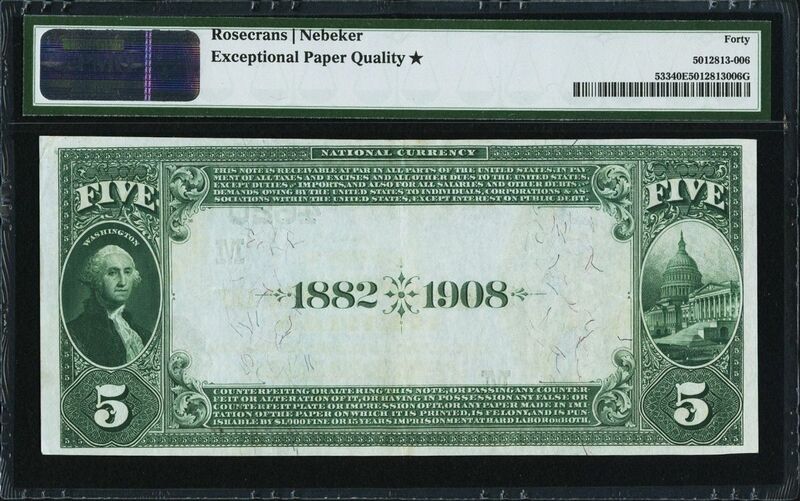 Heritage Auctions posts scans that are not realistic either!! Heritage says, "The margins are outstandingly large for this type, and the gold inks are as deeply colorful as we have ever seen them. PMG likely saw some very minor flaw with the note out of the holder, but in the holder its obvious original embossing along with its other attributes makes it look like a 65 EPQ to us. From The Yuri Solovey Collection"
Now look at their scan compared to mine once I received the note. When will this monkey business stop!!?? I expect it from Ebay trolls, but a fine Auction House?? Did you ever notice that if you could remove the 5 from the SN, you'd have 439439. I liked that note too. It has the misplaced town name going for it as well--Berlin. And it has a vice president's signature. Can't argue the Star either. I have a nice 1902 Date Back from Ch. 4620, SN 676/B464018A pp A/184 in a PMG 30EPQ holder. I liked the short radar bank SN. 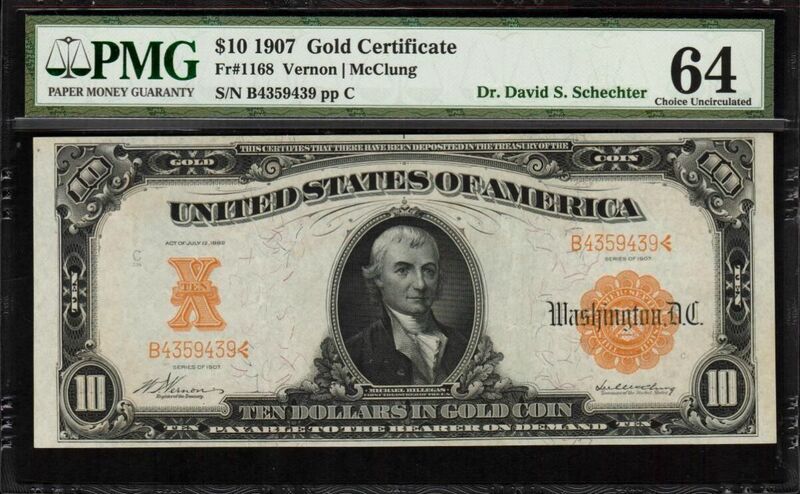 Their 3rd charter date was Aug. 19, 1911 (vs Aug. 26, 1891 above), so it has Napier | McClung signatures. It's actually fairly common as a 1902 DB. 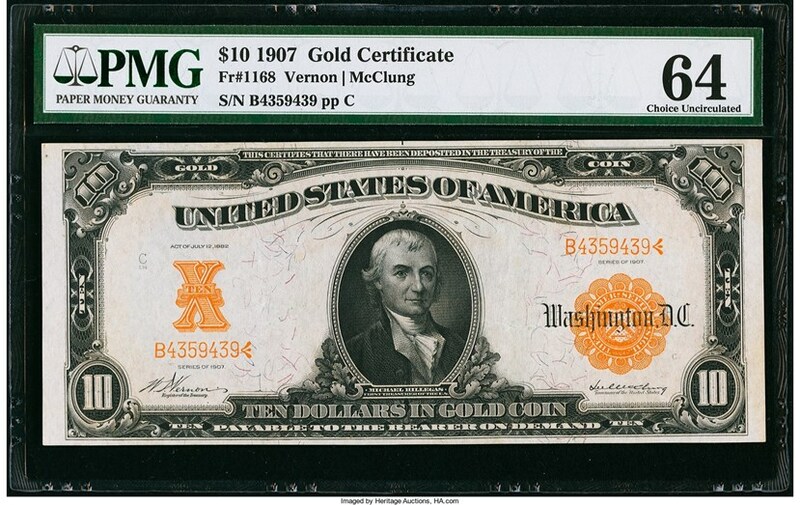 Heritage sold my note as well as part of the Chuck Westfahl Collection. 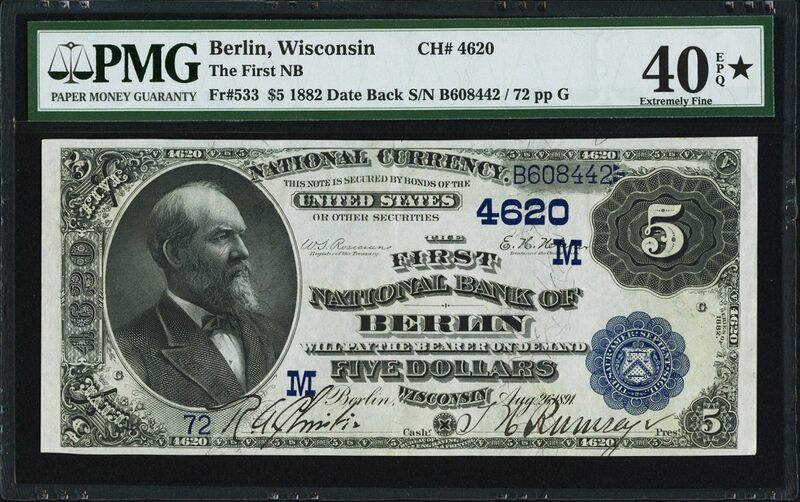 I just made a Wisc.1902 type set <--click to follow link--as I also have a Green Bay $5 1902 DB in PMG 35EPQ (I don't like 1 note sets).